So, what just happened in that first round? The top three seeds were eliminated in the East and both Detroit and Chicago had a much harder time with their first round opponents than I thought possible. I did pretty well with my predictions, being betrayed by only Washington and Buffalo. I’m actually happy that my Buffalo prediction was wrong because I hate Buffalo. That’s a positive. I will take the blame for Montreal’s upset. I said that Washington will win the series if the Earth doesn’t implode before game 4. I didn’t take my prediction seriously and the Hockey Gods chose to punish me. Yup, that’s why the Canadiens won, not because they blocked 1324324 shots and saved 2314463465 more. 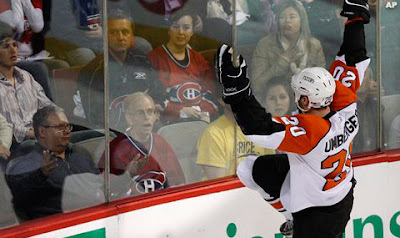 I’m certainly not happy that Montreal upset Washington, but it’s not the worst thing that could have happened. Now the Leafs can rope the Capitals into a panic trade for Kaberle where Brian Burke has his pick of primo prospects. In other fantasy news, Washington losing is really good for my fantasy sports life. I chose late in the first round and was excluded from the best Washington players, which was fortunate since I wasn’t necessarily convinced they could beat Pittsburgh anyways. Now it’s really fortunate considering they couldn’t even beat Montreal! The only Capitals player I chose was Mike Knuble. Most of the other poolies banked pretty hard on Washington. As a result, I am one of two people with nine players remaining, while the rest have six or less. I’m feeling confident with my seven Pittsburgh and Chicago players. But you’re not reading this to hear me gloat about fantasy hockey. Onto the second round breakdown! The first round is over and there are no doubt plenty of pundits weighing in on the second round, giving expert analysis on who is likely to advance and why (I will be one of these fools later today). But can you really trust these people? How did their predictions fare in the first round? I think every time someone gives their predictions they should be forced to show their all-time record, or at the very least their record that season. So in honour of full disclosure I’m showing how my predictions fared in the first round. To make myself feel smart I’m comparing them to so-called hockey experts. It’s hard to be overly excited about the success of my predictions considering there was very little difference between pundit choices. Everyone picked the Capitals, Penguins, Sharks, and Hawks to advance. Even the Montreal newspapers were picking the Capitals to walk away with the series. I checked both the Gazette (Montreal’s English newspaper) and La Presse (one of the city’s French papers) and only one writer had the guts to pick the Canadiens – Ronald King. I don’t know anything about him; maybe he has a history of mental illness. Well, I guess he’s smarter than all of us because thanks to Boston and Montreal he went 7-1 with his predictions. The series that had some difference of opinion (Devils-Flyers, Sabres-Bruins, Canucks-Kings, Wings-Coyotes) were still predominantly favouring the higher seed (except in the Wings series, but most people still picked them despite being the lower seed). There were only a few deviations from the norm here and there. For the most part everyone’s predictions looked very similar and the standings below reflect this. No one did terribly and no one was perfect (from what I could find). That being said, my predictions put me in a tie for second place. PLAYOFFS! And for the record, I didn’t just search out the various predictions that would make me look good! In fact, I actively searched out someone who picked the Canadiens. This list is a pretty wide sampling of hockey writers from various media. Here’s how everyone fared in the first round, including myself. Carey Price is only two seasons removed from a stellar rookie campaign where he wrestled the starting job away from Cristobal Huet as a 20-year-old. Price went 24-12-3 with a 2.56 GAA and a .920%, which prompted Hab fans to call their new netminder Jesus Price. Price was so good that Bob Gainey traded Huet at the deadline to the Capitals. 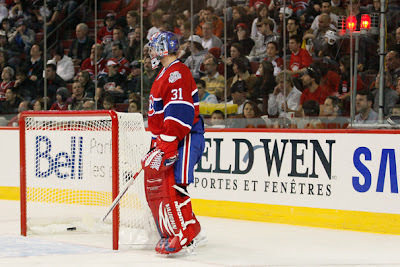 It helped that Huet was becoming an unrestricted free agent and that the Canadiens had another potential number one goalie named Jaroslav Halak playing in the AHL. But Price’s play really pushed the issue. Only two years ago Montreal fans were calling him Jesus and now he’s booed with shocking regularity. Price’s fall from grace has been steep and swift. This post-season I’m watching more hockey compared to the past few years. I’m watching pretty much every series, at least some of every game. When the Leafs are in the playoffs I really only watch their games and in the post-lockout I’ve only really followed players in my pool. Maybe this year is different because I’ve made predictions, so I actually have something at stake in every series. I’m glad I’m invested in each series because they’re all fantastic. The most lopsided game was a 4-1 Nashville victory in game 1 over Chicago. This score is misleading because two of the goals were on an empty net. Every game is close and we’ve had the good fortune of watching a few overtimes as well. There hasn’t been any marathon overtime sessions yet, but I’m sure a three overtime game is on its way. Here are some random observations from the first week of the playoffs. Everybody is making picks and instead of racking my brain for an interesting and unique post to slap up on the site I’m doing the same. The only difference is that I recognize that everyone has a shot at winning, no matter how small (MONTREAL). That being said, I’ve outlined what needs to happen for each team to win and underneath I’ve declared my bold predictions. They say the only thing stupider than predictions is the person who makes them! I don’t know if they actually say that, but I made it up right now. Feel free to use that if everything I predict fails to come true. The Leafs aren’t in the playoffs. Shocking, I know. I thought there was a chance the league could change the rules during the last game and stipulate any team defeating their historic rivals in overtime actually get 30 points instead of 2. Didn’t happen. This is a situation I am becoming accustomed to as the Leafs have not made the playoffs in five seasons (six years). I obviously can’t shut out hockey, but what am I supposed to do? I’m not one to actively cheer for another team, but I guess it’s acceptable to lend my temporary support to a worthy cause. It’s not as simple as just picking a team with your eyes closed. Here are some important criteria for choosing your temporary playoff team. The NHL playoffs are a week away and since the Leafs are once again on the outside looking in my only source of entertainment is fantasy hockey. From a fantasy perspective, it’s almost better if your favourite team is out of the playoffs. That allows you to make cold, clinical decisions about who is the best player to pick, rather than spending the first overall pick on Phil Kessel. Obviously, I’d prefer the Leafs in the playoffs, but playing fantasy hockey with them out has allowed me to hone my strategies as best as possible. I don’t claim to be an expert on fantasy sports and, in reality, any so-called expert is really just making educated guesses. Absolutely no one predicted the Fernando Pisani fantasy bonanza in 2006 or that the Oilers would even make it past the first round. 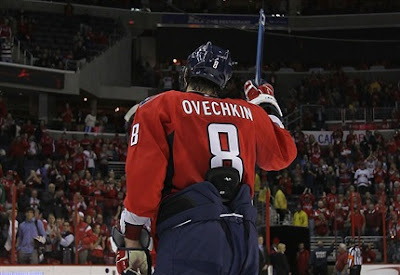 That’s the nature of the playoffs; role players transform into heroes and certain superstars become invisible. 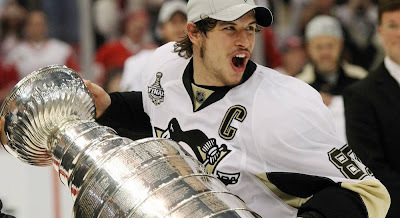 That being said, I tied for first in my 2006 playoff pool and won outright in 2007 (thanks in large part to Dany Heatley – what an anti-heart pick). I couldn’t make the draft in 2008 (I think?) and finished in fifth (out of 10) last year. So I’ve had some success. These are some of the strategies that I’ve used over the past few years that have worked for me. Try these unless your pool is using quirky rules. The most common format is 10 players, no set positions, no goalies, and all that is recorded is goals and assists (most points wins). Don’t blame me if you place last. But if you do win feel free to send some of the winnings my way. Tuesday night the Leafs were mathematically eliminated (I hate math) from the Stanley Cup playoffs after a defeat to the Thrashers, thanks to former Leaf Nik Antropov, combined with a Boston win against New Jersey (in a riveting 1-0 trap-fest). The Leafs may have been alive technically, but in reality they were eliminated from the playoffs in October after starting the year 0-7-1. This was a tough season to watch. For most of the season there was little to be excited for and any few wins the Leafs strung together were followed rapidly by many losses. Watching the Leafs this season has been like going through the five stages of grief, although, instead of grieving for the loss of a loved one, I’m grieving for the death of my hopes and dreams. The season isn’t over, but it’s time to say goodbye. This is the most fitting way I could think of.